The Approach is the crux for sure. The rock is good enough if your cautious. 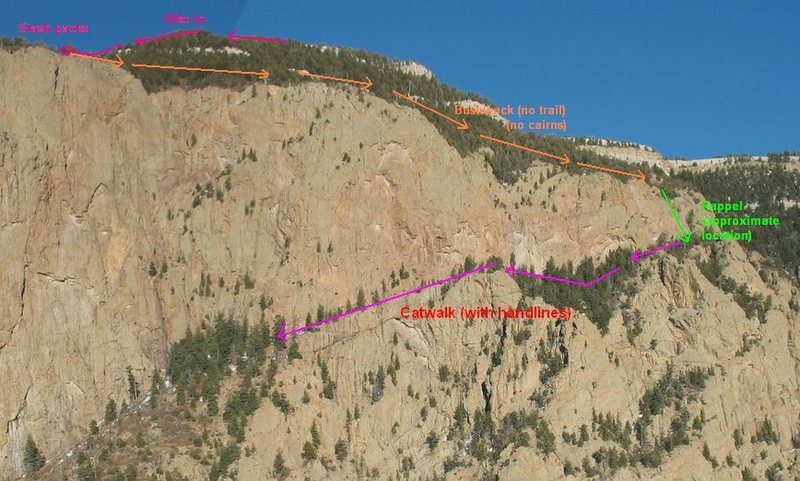 The route is an excellent solo, just make sure your damn solid at the 5.3 grade! Bringing a rope on this route would be a lot more work than its worth. Its 85% 4th class then a bit of 5.3 at the top that is really fun. The route is the NW Ridge of the Shield. Follow the Crest Trail north, until you see the "10 K Trail" post mark. In this clearing go to the edge of the limestone band, and start descending the gully. There are some game trails but for the most part you`ll be suffering in the brush. The prominent ridge line on your left is the route. There is a well defined trail on the ridge line that takes you up the route. Randy climbing the 5th class. Miles of virgin? terrain just outside Albuquerque. Such a cool feature to have in our backyard. A view of The Shield's southern face. From the top of the upper 5th class. A few years back a buddy and I did it in Jan. or Feb. just for fun. You generally stay on the north side of the ridge, but since it was iced up, we had to stay on the south. There's a second "crux" near the top where the ridge steepens and it's a little trickier if you have to go to the south, as we did. Anyhoo, I pulled down on a big ol' block and it was fine. Behind me, my partner did the same and he was left holding an 80lb block of granite. Just before he fell. If we hadn't been roped up, he would be dead. Thanks, John. Sounds like the conditions depend some on the current activity level. I'll give it a go one of these days. I do this solo at least once a year. Can't imagine a year going by without making the pilgrimmage. I park at the Piedra Lisa lot and walk up the knife edge, continue up through the limestone band,then take the north crest trail to the TV towers and come down chimney canyon. There's a beautiful rest spot on top of the limestone band just before you hit the North Crest trail, another on the grassy aspen knoll as you start down (just above muralla grande and chimney canyon), and another couple at the bottom of Chimney Canyon near the base of muralla grande/Warpy Moople. and then a bit of exposed and unprotected 4th class traverse to hit the well-maintained Fletcher Trail back to the cars. 'Such is youth' - Herman Melville. So I read a number of reports on this before I went and did the route Sunday. I have to be honest though that I didn't see any 5th class climbing. I'm not try to sandbag either, I just never felt I was in a position where I was actually climbing anything. It could be a height related thing though as I often am able to skip holds and avoid moves that others aren't. Anyway, I rated this class 4 the whole way. I thought Cabezon was harder. I've always thought the W section was low 5th class, or at least exposed enough to warrant 5th class, much harder / more exposed than Cabezon IMO. Wow, just did this route for the first time today. I'm not ashamed to say we brought a 30m rope, and roped up for a bit of it. Saying that a rope would be more trouble than it's worth is misleading. All three in our party were glad to have it and a bit of gear. I think we stayed roped-in for about 3 rope-lengths from the W, which took some thoughtful gear placement. It still would have extremely sucked to fall in a few places, but the rope gave us some peace of mind. The cruxes aren't physically difficult, but are extremely exposed and oddly technical (downclimbing and chimneying). There is also a decent amount of loose rock, some of which is hard to avoid (including some suspicious rock at the crux!). Luckily we planned for a bit more of an undertaking than would be implied by this description. I'd HIGHLY recommend going with someone who knows the route, there is some very tricky routefinding. We parked at the Piedra Lisa TH, and took the tram down. This made for approx. 1/3 climbing, 2/3 hiking. The hiking was certainly the most physically demanding part. Good God this route is awesome. Best option is to hike up, climb, then hike over to the tram. There's also a shield/ramp descent that I'm investigating. You don't need to rope up. Just take a tiny bit of gear (I mean like 3 cams) and long slings and just give yourself some backup handholds on the sketchy parts. Recently linked the three big Sandia ridges together in a day - the Knife Edge, the SW Ridge of the Needle, and the NW Ridge of the Thumb. I had dreamt this up some years ago and called it the Sandia Trifecta. It is hard to believe that such incredible, high quality ridge climbs can be so logically combined in a car-to-car loop 10 minutes from home! Highly recommended!